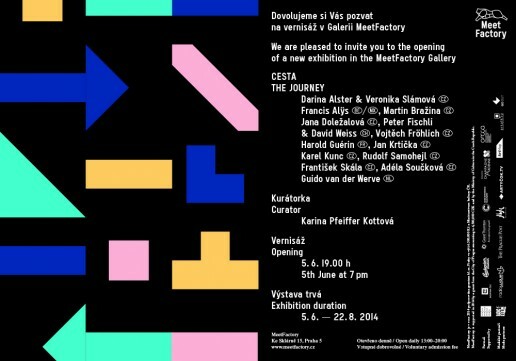 MeetFactory Gallery presents a large group exhibition mapping projects inspired by the motif of a journey, by artists of the youngest generation as well as those who have already won international acclaim. A number of new artworks were commissioned for the purpose of this exhibition and will appear along with canonic works such as the film The Right Way by Peter Fischli and David Weiss, or the Venice project by František Skála. The exhibition renders the topic of motion in contemporary art, but also of the tension between the place of the work’s origin and the place of its presentation, between the space within and without. The journey = longing. Why is it so fascinating to escape everyday stereotypes and set out, be it in an urban landscape or the wild? “Wanderlust” is a human constant. We feel the urge not to get stuck in one place, explore the unexplored, and to get hands on experience actually, or at least virtually. We strive to get acquainted with global navigation and ignore boundaries, as well as take risks, have time to think, wait for an ingenious idea or just see the sunset. The journey = political affair. Not all paths are passable and not all zones open both ways. Sometimes one has to choose one’s own direction, diverting from general expectations. One decides not to follow the crowd, or go for a holiday in Bibione. The journey = loneliness. You may talk to someone along the way and miss the purpose of your journey in the meantime. As a test of courage, there is also the need to come to terms with one’s own present. The journey makes it easier, as unlike other things, it keeps going somewhere. For artists at the turn of the last two centuries, the way out of their studios had to do with the newly acquired freedom, but also with the loss of a privileged status. An artist with a backpack on his shoulder may be well mistaken for a vagabond and his or her work accomplished along the way for a product of nature or even for a mere coincidence. This may be a partial explanation of the monumentality of some Land Art projects that can be fully observed only from a bird’s eye view. Or quite on the contrary, a slant toward quite minimalist interventions into a landscape almost untouched by the human hand, which however often ended up captured in a nicely framed photograph in some of the leading world exhibition venues, thus eventually saving their ephemeral character for eternity. By this I just mean to suggest that the world beyond the outlined trajectory from a studio into an art gallery and back has been the focus of artists for quite some time, so that the present topic is not a special discovery. Yet it keeps changing both in its raw contours and subtle nuances, depending on individual artistic attitudes and the more general situation in the contemporary art. While in the time of the Barbizon School and beginnings of Land Art the outcome of a journey was still a physical work, be it a landscape painting or a nest made of meticulously piled up flat stones, a shift towards performance and conceptual art provided the journey itself with much greater meaning. The fateful encounter of two artists in the middle of the Great Wall of China or the sudden escape across the Old Town Square from a bunch of friends became the very focus of the artist’s interest, the motion became an end in itself. For the emerging generation of artists, the journey may be a surrealist return to the past, a physical contemplation of weather conditions while driving a car, a collective picking of artifacts, a parachute jump. It may materialize in monumental installations, or stay at the level of a personal memory suggested by more subtle media. When a journey becomes the theme of an exhibition, a kind of inimical element enters the game: the static, impersonal art gallery, which artists through the last century tried to conquer so many times, by breaking its walls with excavators, and even digging tunnels under it. And yet, their craters were just large scale pictures perfectly framed by the four white walls. In this sense the exhibition at the MeetFactory Gallery is more considerate, be it only for the reason that a twice-told joke is no longer funny. Its domain is the ‘here and now’: this summer, at this very place between the rails and the highway, where the artists who circled the world meet with those who perhaps just reached the edge of their hometowns, yet in both cases on quite personal and relevant grounds. The exhibition’s mood is lighthearted, yet its approach to its journey is serious – its longing is to defy stagnation.